The face (or rather the body) of the shape of things to come in terms of human/robotic exploration of the solar system has arrived. As NASA gears up for the penultimate flight of the Space Shuttle this coming November, a special payload is nearing completion – a payload that is hoped will help revolution human-robotic interaction and exploration of sol system bodies. Dubbed Robonaut #2 (R2 for short), the cornerstone of humanoid robotic technology is part of a phased program to increase robotic exploration of Near Earth Objects prior to or in place of human exploration. Robonaut 2, a “state of the art anthropomorphic robot, with the payload, speed and dexterity that enable it to do work, differentiating it from other humanoid robots,” is a fully dexterous robot developed by JSC engineering in partnership is General Motors. Like R1, the immediate predecessor of R2, Robonaut #2 has demonstrated its ability here on Earth to utilize internal/external ISS interfaces and EVA tools designed for astronauts. 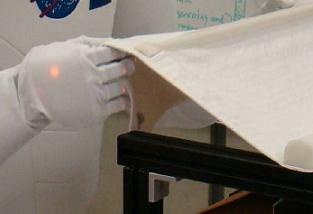 However, like all advances in robotics, R2 is at least 4 times faster than R1, more compact, more dexterous, and “includes a deeper and wider range of sensing,” notes the white paper document associate with the human looking robot. 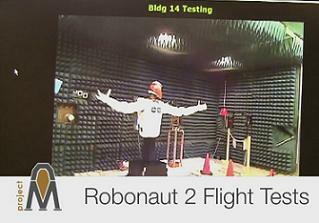 In all, 36 patents have been filed for technology utilized in the Robonaut 2. While R2 has more than proven itself with testing here on Earth, space-based testing is something still outstanding for the program. As such, a plan was created to enable this kind of testing on humanity’s premiere space laboratory: the International Space Station. The flight of R2 will help validate the launch process of the unit as well as the ability to asses its operational capabilities inside space vehicles (such as the Space Shuttle and the ISS). Additionally, work on the ISS will validate R2’s ability to manipulate tools and spacecraft interfaces in a microgravity environment; teams will also be able to monitor the unit’s reaction to the EMI/Radiation environment of space. In all, Robonaut’s basic tasks will be to interact with the crew and assist them with work activities. Placement of Robonaut 2 on the ISS will also help demonstrate the robot’s basic capabilities performed on Earth by way of ground control or ISS crew control. 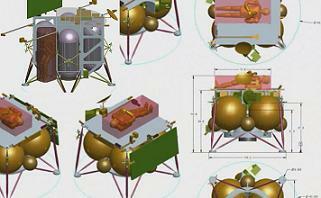 This will help engineers and ISS program mangers gain confidence in the unit over a given period of time. Robonaut 2 will also be responsible for Public Relations activities and educational demonstrations once up and running. However, like all programs with NASA, Robonaut 2 will not undergo full implementation once it arrives on the ISS via Space Shuttle Discovery. Instead, a three step, phased approach will be used. 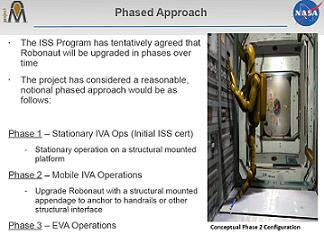 “The ISS Program has tentatively agreed that Robonaut will be upgraded in phases over time,” notes the NASA Project M presentation. Phase one of Robonaut 2’s certification for the ISS will involve stationary IV (Intravehicular) activities on a structural mounted platform in the Destiny U.S. lab. For this phase, R2’s upper torso, a task board with primary experiment station, base plate with structural interface to ISS, stanchion, torso “softgoods,” torso adapter, and stowage bag with flammability control will be used. “Robonaut will have the capability of being controlled from the ground or locally on ISS and must always be connected to an ISS Laptop for operations,” notes the NASA presentation. 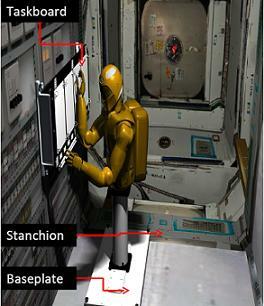 When not in use during Phase I, Robonaut itself will be stowed in LAB1P1, an empty rack bay in Destiny. When in use, Robonaut’s baseplate will be operated on LAB1D2 with its task board operated on LAB1P2. In all, Phase I operations will be split into four sections: Phase I-A, Phase I-B, Phase I-C, and Phase I-X. Phase I-A includes Robonaut’s launch inside PMM Leonardo in Discovery’s Payload Bay, unpacking and mounting on the IVA worksite in Destiny and verification of fit and stability, establishment and verification of power and data interfaces, and verification of Robonaut’s health including assessments of all sensor signals, safeties, and single joint check outs. Once these steps are complete, Phase I-B will include a stepped increase in R2’s operations, limited speed, forces, and workspace operations, and free space operations including single joint, coupled joint, single limb, dual limb, and safety demonstrations. These operations will be followed by contact operations, which include restricted contact, simple task board and increased task board ops, and complexity assignments – thus completing Phase I-B operations. Phase I-C will then involve restricted contact of R2, the performance of simple task board ops, and the manipulation of softgoods. Phase I-X, the culmination of Phase I of Robonaut 2 operations, will involve commanding the robot to perform increasingly complex tasks on its task board using its limbs and articulating fingers and thumbs, the incorporation of tools into the task board ops (permitting R2 to grab and manipulate tools with its hands), the performance of tasks cooperatively with the ISS crew, and the engagement of Robonaut in educational and Public Relations tasks. Once mastery of Phase II has been accomplished, Phase III will involve upgrading Robonaut with the ability to perform EVA tasks. In preparation for Robonaut 2’s launch to the International Space Station, all relevant environmental testing of the hardware was completed in 6 weeks (with design changes incorporated as a result of the findings). Additionally, all ISS compatible power supplies for Robonaut were designed in 3 weeks, all R2 firmware architecture was redesigned for radiation fault tolerance in 4 weeks, all 55 R2 circuit boards were fabricated and tested in 8 weeks, and a complete refabrication of all R2s cables using “flight certified techs and materials” was undertaken by the team. Therefore, with Robonaut currently at the Kennedy Space Center undergoing final launch preparations, it is quite possible that the shape of things to come for manned/robotic exploration of the sol system has arrived. But, as they say: all of this has happened before and all of this will happen again.